Contact the owner Dave @ 920-901-5599 or dgreenwood@lakesidefoods.com. Six (6),30HP Atomic Four gasoline engine w/ auto-fire suppression system, 135% Genoa w/ furler,Mainsail, Smaller emergency forsail, Traveller, Vang & boom kicker,Gar-Haur Genoa adjuster, Wind speed &direction instruments plus depth gauge,Radar reflector, Winches: 2 Lewmar. 2 Anderson two speed self locking, Auto-helm, Bimini, Dodger, mainsail cover, steering pedistal and winch covers all of heavy duty dark blue canvas,Stern swimming ladder,(plus emergency MOB ladder). Lifesling & life belt on stern rail,White vynal cockpit seat covers, Battery operated & self blown fog horns. Inboard: Two sinks w/ hot and cold water. (Water is electric and engine heated), Two water tanks, Propane heated stove and over, on gimbals, Micro-wave oven,Refrigerator, Head, Navigation desk plus many charts of Lake Michigan, Radio & TV,Two VHS transmitter/Receivers, Two bilge pumps plus high level alarm, Three fire extinguisher, Six regulation life jackets, *Six man self-inflating life raft, Emergency side boarding ladder, GPS Plotter on steering pedistal, Master compass. Operating & Maintenance manuals for everything on board, Motor-generator set, 110v (AC & 12v DC), 3HP electric trolling motor, Frame for hanging motor off rail, Two man "going ashore" inflatable dinghy, Paddles plus manual & battery inflators, Fold-up "going ashore" bike, Heavy duty wire cutter, Emergency tiller, Canvas mast climbing ladder & bosum's chair, Portable cabin cooling fan, Up to date & old flares,Spare propeller, pipe fitting & engine parts, Overboard restraint system, Binoculars & self blown fog horns, Winter cover & storage stand. * six (6) man self inflating life raft professionally tested and completely refurbished in 2010. 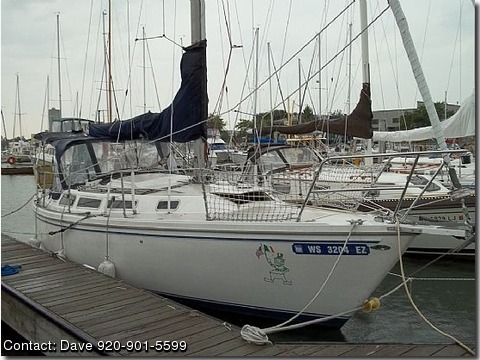 New Items:Mast climbing ladder and Bosuns chair,Brand new hot water heater,Charts for Lake Michigan and the North Channel of Lake Huron,sail repair kit,Binoculars,Battery charger for Plotter,Many smaller items.